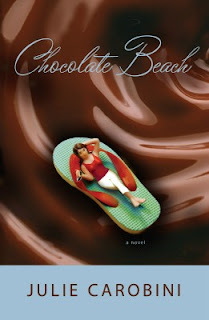 Today I have and interview with my California beach-babe friend Julie Carobini about her new mom lit novel, Chocolate Beach! Bri Stone has it all: the man of her dreams and their surf-ridin' teenage son, a chocolate-loving best pal, an adorable beach bungalow, and a kicky job as a Southern California tour bus host. She also has a few things she didn't ask for: a know-it-all friend, a snobby mother-in-law, and a Fabio-meets-Dilbert boss. All three of them seem eager to share their strong opinions and suspicions about Bri's relationship with her husband, Douglas. When Bri's rose-colored glasses crack after she finds evidence that Douglas has grown tired of her carefree ways, she resolves to win him back. Can Bri reinvent herself--and recapture his heart? You've written tons of articles. Have you always wanted to write a novel but did articles to get your feet wet? Or did you decide one day to come over to the dark side? I always wanted to write romance novels, but as my relationship with God grew, I couldn’t stomach writing the kinds of things that I’d read as a young adult. I was at a standstill, and eventually realized I didn’t know what I was doing anyway. Other than college, I’d had no formal writing training. 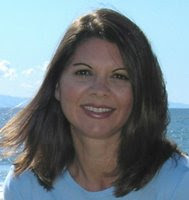 That’s when my friend Kathi Macias offered a writing class in town. She talked about all the opportunities out there to write for God’s glory. I’d had no idea! Even though my eventual goal was to write novels, I decided to learn the craft in bits, through writing personal experience stories. Eventually I began to write full features for magazines and our local paper. In between, I wrote two novels that didn’t sell. Chocolate Beach, well, third time’s a charm, you know? Um, yeah, it does, Camy. :) Back to your questions, I agree, my book is wrapped in a decadent cover. Thanks to artist, Ann Gjeldum! As for the title, I came up with that. Don’t ask me how. It just popped into my head and wouldn’t leave. Bri and Gaby, the gal pals in Chocolate Beach, regularly wallow at the beach with a basket of brownies, and Bri eventually discovers chocolate’s versatility. So there you go. Do you have a Bible verse for your writing? Dt. 31: 6--Be strong and courageous. Do not be afraid or terrified because of them, for the Lord your God goes with you; he will never leave you nor forsake you." AMEN! exhausting, exhilarating, fattening (from all the sitting), fun, disconcerting, and a dream come true. If you were a chocolate, what would you be and why? The finest pure chocolate truffle. Two reasons: That’s how God sees me (and you too! ), and besides, life’s too short for cheap chocolate! If you could do any type of extreme sport professionally, what would you do and why? I’d want to run ultramarathons! That’s 100 miles, baby! Whoa! Are you serious? I’m tired just thinking about it. Thanks for the fun interview, Camy, and thanks for those of you who took the time to read it! Drop me a note sometime, and tell me how you like Chocolate Beach. Now go forth and eat chocolate . . . !